Perhaps you’re wondering why I’ve gone all quiet about our garden. Honestly, it’s been sad. Due to a severe water shortage a couple of months ago and our constant travelling, the front garden patch almost entirely wilted. We manage to salvage the potted plants and move them to the back yard where, I’m happy to report most of them are thriving. In this severe heat, we’re touching 40-42 degrees centigrade, attempting to restart the garden during summer is a waste of time. What’s more the water situation in Hyderabad is somewhat ‘iffy’ during summer. So we’ve taken a conscious decision to wait until the end of June to get things back on track. We’ve been thinking of various things we’d like to do to brighten up the garden apart from planting colourful flowers and plants. We’re planning to buy some pretty planters and also make some unique ones out of discarded crates and jars. Like the saying goes, ‘one man’s junk is another man’s treasure’ so I’m going to be asking the extended family for discards like tea pots, old boots, bottles, tin cans and even tryes! I’ve got myself some paint to make the earthern pots look colourful too. There are plenty of websites with some fantastic DIY ideas for these. While we have good street lighting, we’ve decided to add some outdoor lighting to our little garden. This will mainly be in the corners to highlight some of the plants and my soon-to-be planters. 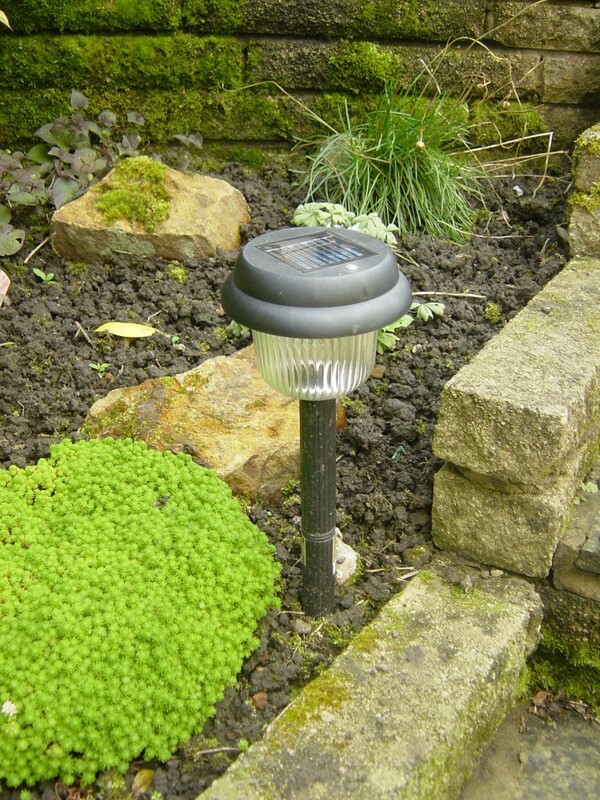 We want subtle lighting and are on the look out for some simple solar powered light fixtures. We’re thinking of a few lamps like the one below among the flower beds and a couple of rattan solar powered lanterns under the awning. There is such a variety of birds here that we simply can’t forget them. We’re planning on getting a couple of bird baths put immediately during the summer for birds to bathe and drink. Some pretty bird feeders to attract more birds and add colour to our garden will follow. This quote has got me quite inspired to do something unique with our garden. I’ll keep you posted on the progress as it happens. Do you have any ideas for us to brighten up our garden? Like every summer I collect the seeds of the King of Fruits, ‘hapus’ after savouring its pulp and plant it in the pot. three shoots have popped their heads above the soil proudly nodding. our works has borne fruits and when the rains commence we will re-plant them on the patch of garden allotted to our building. We are in drought, too and I fear my garden won’t survive! Isn’t that such a painful sight to see, Carol? Lucky you to have a garden. My little balcony garden was uprooted when I had Malaria and Dengue in two successive years. This is our temporary home – so we’re trying to enjoy while we can, Sunita. I live in an apartment big enough for 2 of us..and why I am telling you this? Cos there is just one balcony which is super small. But then for my love of greens, I have some 20 plants there and I love to see them grow..This year I wanted to go something different with my balcony garden and so I have planted green chilly and tomato seeds..Every day when I go back home, I look forward to flowering, pollination and them some fruits (chillies and tomatoes) in form of hard work. Last weekend, I also cut open an old sprite bottle from the center and made a planted to hang from the window.. Thanks for sharing, Parul. I think I need to absorb some of your passion! Corinne, I love how you will be using discarded items to become new homes for the plants and flowers. How inventive! As you probably already know, my only garden resides on our deck in potted plants. I will probably have a blog soon about what we’ve planted this year. Will enjoy seeing your updates! Ah! These are all borrowed ideas, Martha. I’m wondering if we should stick to potted plants too. Look forward to reading your post about what you’ve planted this year. I love that quote – “A garden should make you feel you’ve entered privileged space” – which is exactly how I want to feel, walking into a flower garden! I want a gated one where you open the gate, walk in and your breath is taken away by the beauty of plants and flowers!! At our other home we had a huge flower garden. Here there are so many rocks that we’ve had to resort to raised-bed gardening and having pots and containers scattered around the deck area and pool. I like that I can change out plants every spring if I want to, but I do miss my huge garden! Wouldn’t a gated garden be just fab, Nan. I’d love to see a picture of your garden. I think we’ll have to settle for pots and containers too. O yes, colourful and different types of planters can make any garden look vibrant and happening! My husband and I have major disagreement on using coloured planters…I want to paint just a few of my old planters in some bright blue and red colour – just to add a bit more colour, he is not so keen. Though generally I too the natural old terracotta, but just a few blue ones would be nice I think….well, I am working on him, maybe soon 🙂 Good luck with beautifying your garden, those lights will surely brighten the spot.